I would like to have the painting in landscape direction. 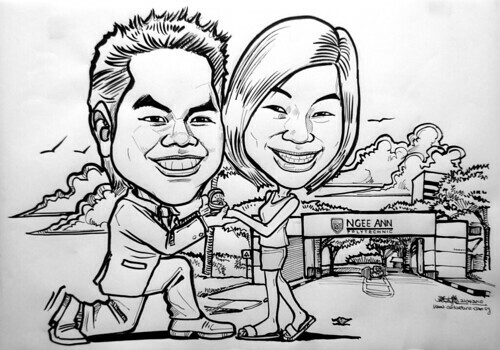 The setting background of the painting will be the main gate of Ngee Ann Poly (refer to file: NP_MAIN), and the position of me and my financee I will be one knee down (refer to file: down on one knee). I will be wearing a black suit with black pants witha green V-neck in side, she will be wearing beach wear(singlet and shorts). Both faces will be facing the observers. (hope you get me)."